Breakfast at your hotel in Cairo and then met by your personal guide who will accompany you to Giza Plateau to visit one of the seven wonders of the ancient world, the Great Pyramids of Cheops, Chefren and Mykerinus, famous Sphinx , varying between six-thousand and even thirteen-thousand years old ,and Valley temple facing the great statue. Lunch at good quality local restaurant. Then transfer to enjoy the Egyptian Museum, Treasures room for the child king Tutankhamen. Continue to Coptic Cairo to visit the Hanging Church and Ben Ezra Synagogue. Combining fascinating history with shopping in a lively Khan El Khalili Bazaar, this dates back to 1382. Back to your hotel. Overnight in Cairo. 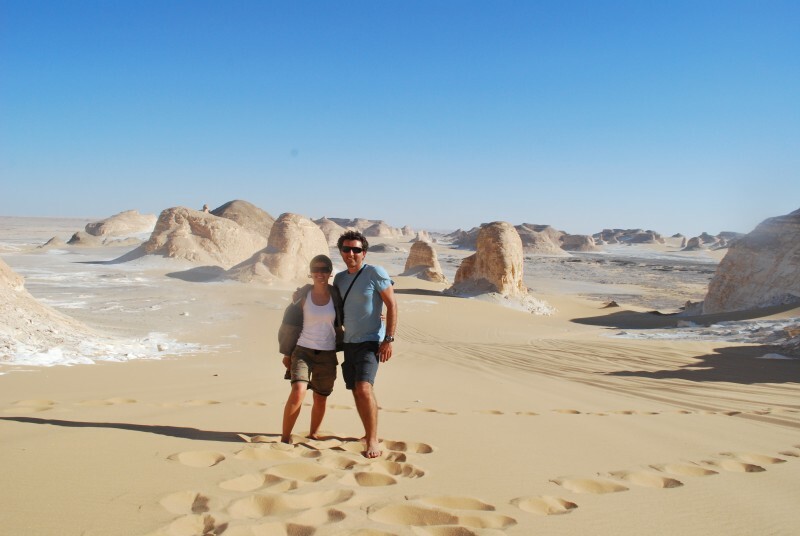 Egypt Travel representative will pick you up from your hotel in Cairo, then drive to Alamein, about a 3 hour drive. At Al Alamein, you will enjoy the site where the great battle took place during WW II, and visit the WW II Museum and the Cemetery. Then drive on to the beautiful bay of Marsa Matrouh on the Mediterranean Coast then continue to Siwa. It is about a 6 hours drive from Alamein to Siwa. Dinner and overnight in Siwa. Breakfast, enjoy your visits in Bahariya Oasis. Enjoy a tour around the old village and see the groves of palms and fruit trees.Then onto the "Golden Valley of Mummies" from the Graeco-Roman period, then visit the Tombs of the Nobles. Lunch in Bahariya. Head to the White Desert, passing through the Black Desert and the Valley of El Haize with its famous spring. Stop off to see the quartz crystal at Crystal Mountain, the petrified wood and volcanic rocks in the Valley of Agabat. Bedouin dinner and entertainment. Overnight camping in White Desert. After breakfast, head to visit the royal cemetery for 62 Pharaohs, Valley of the Kings, then to mortuary Temple of Queen Hatshepsut, which was built by the architects of the New Kingdom Pharaoh Hatshepsut in the 15th century BC. Proceeding to the Colossi of Memnon. Lunch at a good quality restaurant. Then you will see the magnificent Karnak Temples and Luxor Temple. After that you will be driven to Luxor train station taking sleeper train to Cairo. Breakfast aboard the train and then arrive Giza train station, meet & assist by Egypt Travel REP and transfer to your hotel. You will arrive at Giza station at about 06:00 am and I will do my best to do early check in for you. Optional tour in Cairo to visit Step Pyramids of King Zoser in Sakkara and Memphis. Overnight in Cairo.